Everyone knows the dignity and drama evoked by Sholem Aleichem’s stories as translated into the hit musical, “Fiddler On The Roof.” Now, take a look at the lighter and zanier side of the Jewish experience as New Jewish Theatre presents the local premiere of “Shlemiel The First,” based on Isaac Bashevis Singer’s silly tale of a shlemiel named Shlemiel and how his town of not-so bright residents send him on a non-sensical journey that confuses and confounds almost everyone. Noted theatre producer, director and scholar, Robert Brustein, somehow thought this story would make wonderful theatre. With lyrics by Arnold Weinstein and music by Hankus Netsky, for some reason, it works. 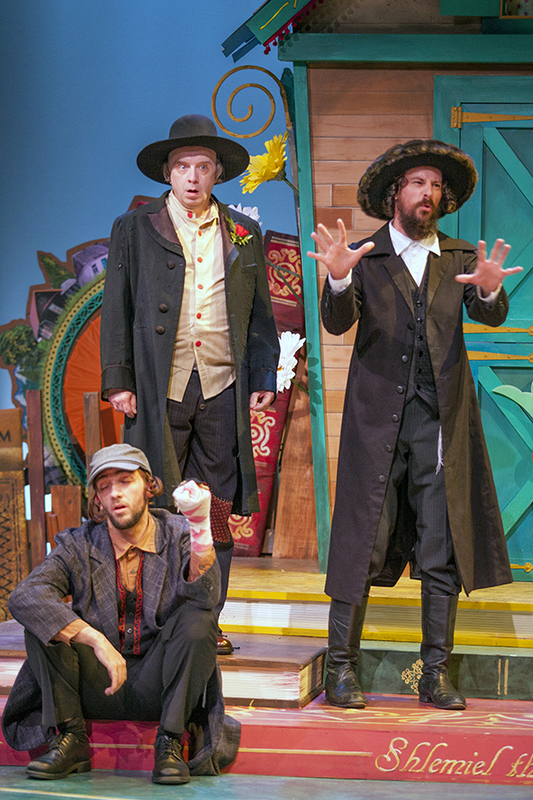 In lesser hands, it probably wouldn’t be as entertaining, but with New Jewish Theatre and director Edward Coffield, a lively cast makes a silk purse out of a sow’s ear (not Kosher, perhaps, but true). The implausible story of Shlemiel heading out on a journey around the world to spread the wisdom of the local “wisest man,” Gronam Ox, becomes even sillier when Shlemiel makes a wrong turn and winds up back in his home town of Chelm where he convinces everyone he must be in an alternate universe where his wife and all the townspeople are exactly the same but they must be different. So they become convinced and realize he must be Shlemiel the Second. 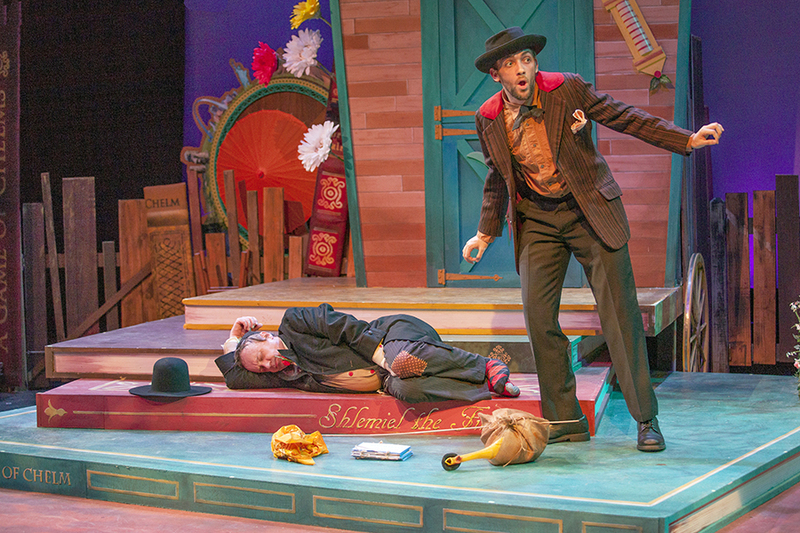 Antonio Rodriguez, Terry Meddows and Todd Schaefer in “Shlemiel The First” at New Jewish Theatre. Terry Meddows simply shines as the hapless Shlemiel. Once again, as in his last triumph, “Waiting For Godot” at St. Louis Actors’ Studio, his boots lead to questionable choices for his character. His singing voice is surprisingly strong as well. As his wife, Emily Baker adds to her list of memorable performances. She becomes a beacon of sanity in the muddled world of Chelm and its gullible citizenry. She takes the high road and makes the best of the new-found romantic tendencies of her addled husband. Taylor Pietz and Mike Dowdy add to the mix with their refreshing portrayal of their two bickering children and then show their versatility in playing other citizens including a wonderful turn by Dowdy as one of the gossipy women. Todd Schaefer is a revelation as the self-proclaimed wisest man in town, Gronam Ox. His great comic timing, overly dramatic facial features and dancing that would make Groucho Marx jealous, add up to a top-notch performance. As his wife, Johanna Elkana-Hale also masters the comic timing and displays the most powerful singing voice of the show- just as she did in last year’s Insight’s production of “…And The World Goes Round” (also directed by Mr. Coffield). The comic trio of Anna Skidis, Keith Thompson and Antonio Rodriguez just about steal the show with their campy portrayal of the three other wisest men in town (maybe six- since each also sports a sock puppet with views and voices of their own). Mr. Rodriquez also does a delightful turn as the “heavy” of the piece- Rascal. They all get the best workout in the show with zany dance numbers accompanied by the great Klezmer orchestra headed by musical director, Henry Palkes. The Klezmer style features a lot of fast-paced music which just adds to the frenetic quality of “Shlemiel The First.” In addition, this wild abandon is further fostered by the lively and extremely inventive choreography of J.T. Ricroft. This whole cartoonish style is enhanced by the wonderful set design of Margery and Peter Spack. With outlandish colors and off-kilter set pieces featuring touring wheels in the backdrop that mark Shlemiel’s journey (including the St. Louis Arch, the Coliseum and the Eiffel Tower, among other sites) and the infamous “Elsewhere” donwstage, this is one of the cleverest designs we’ve seen in some time. The Michele Friedman Siler costumes are perfect representations of the characters and the whole production is further enhanced by the Kimberly Klearman lighting design. On a bad day, “Shlemiel The First” could be the worst idea ever. But in the hands of the talented, exuberant cast and the masterful direction of Edward Coffield, J.T. Ricroft and Henry Palkes, this turns out to be a wonderful example of “turn off your brain and just enjoy the insanity” type of production. You won’t walk away with any profound thoughts, but you will have enjoyed 85 minutes of non-stop joy and merriment. 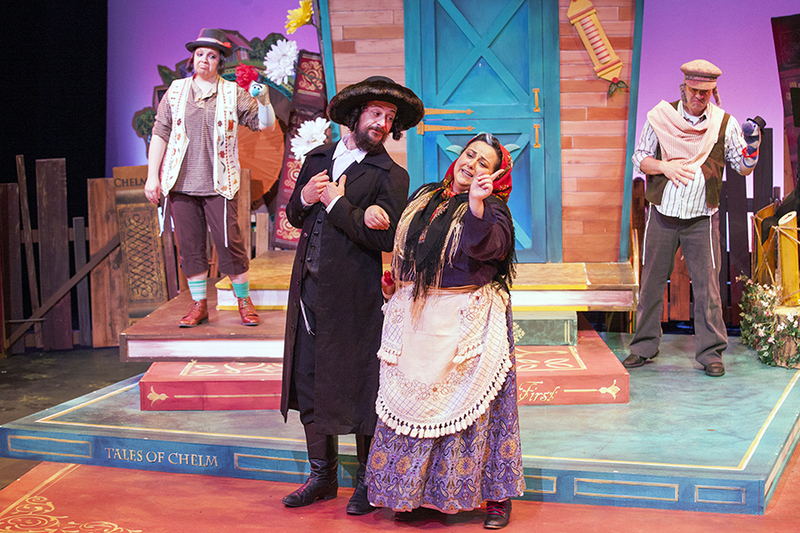 Catch “Shlemiel The First” at New Jewish Theatre through June 9th. Contact them at 314-442-3283 or at newjewishtheatre.org for tickets or more information. This entry was posted on May 18, 2013 at 9:43 am05 and is filed under Uncategorized. You can follow any responses to this entry through the RSS 2.0 feed. You can leave a response, or trackback from your own site. Great blog! Will help me keep in the loop with St Louis theatre!